Polar’s shallow footing form is a time saving, lightweight approach completing the foundation work of your project. Perfect for slab on grade light construction this form is made of high-density polystyrene. That means it is easy to handle and a snap to set in place, speeding up site prep work and saving labor. And since it is pour in place it stays to insulate the footing, so form stripping is eliminated. The form is designed to get the job done quickly. 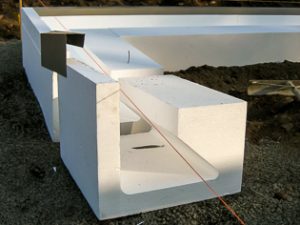 Pour a monolithic footing and slab at the same time, when it is done everything is fully insulated with the high thermal performance and long-term reliability of polystyrene. Reducing heat l oss from the foundation prevents freezing of soils under the foundation. 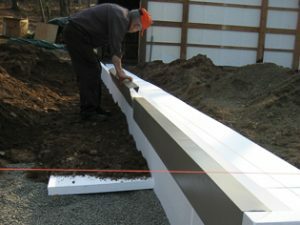 The frost protected shallow foundation is also applicable to unheated parts of buildings such as garages by conserving the geothermal heat reserves in the soil below the building. When used in conjunction with PolarGuard® or PolarGuard® GPS insulation under the slab and extending horizontally out from the foundation, the Shallow Footing Form is an integral component of an accepted, low cost foundation.